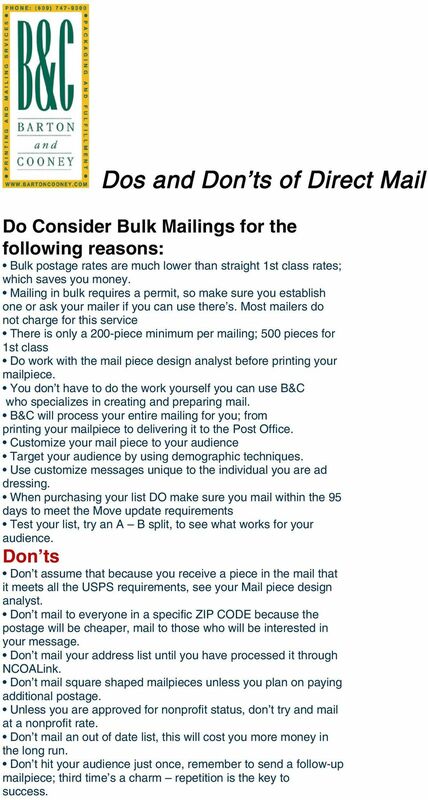 Download "Dos and Don ts of Direct Mail"
1 Dos and Don ts of Direct Mail Do Consider Bulk Mailings for the following reasons: Bulk postage rates are much lower than straight 1st class rates; which saves you money. Mailing in bulk requires a permit, so make sure you establish one or ask your mailer if you can use there s. Most mailers do not charge for this service There is only a 200-piece minimum per mailing; 500 pieces for 1st class Do work with the mail piece design analyst before printing your mailpiece. You don t have to do the work yourself you can use B&C who specializes in creating and preparing mail. B&C will process your entire mailing for you; from printing your mailpiece to delivering it to the Post Office. Customize your mail piece to your audience Target your audience by using demographic techniques. Use customize messages unique to the individual you are ad dressing. When purchasing your list DO make sure you mail within the 95 days to meet the Move update requirements Test your list, try an A B split, to see what works for your audience. Don ts Don t assume that because you receive a piece in the mail that it meets all the USPS requirements, see your Mail piece design analyst. Don t mail to everyone in a specific ZIP CODE because the postage will be cheaper, mail to those who will be interested in your message. Don t mail your address list until you have processed it through NCOALink. Don t mail square shaped mailpieces unless you plan on paying additional postage. Unless you are approved for nonprofit status, don t try and mail at a nonprofit rate. Don t mail an out of date list, this will cost you more money in the long run. Don t hit your audience just once, remember to send a follow-up mailpiece; third time s a charm repetition is the key to success. 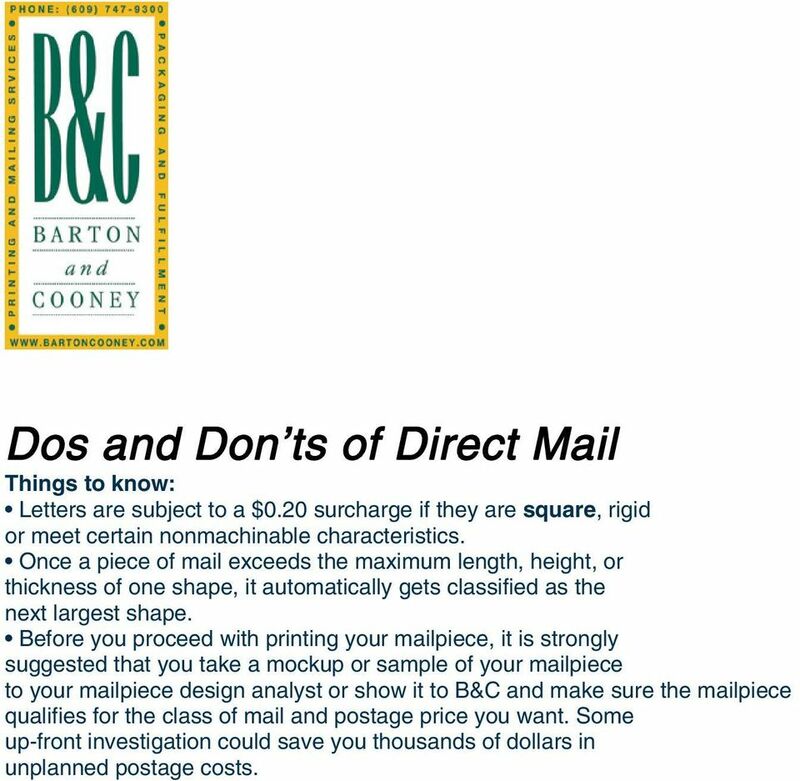 3 Dos and Don ts of Direct Mail Things to know: Letters are subject to a $0.20 surcharge if they are square, rigid or meet certain nonmachinable characteristics. Once a piece of mail exceeds the maximum length, height, or thickness of one shape, it automatically gets classified as the next largest shape. Before you proceed with printing your mailpiece, it is strongly suggested that you take a mockup or sample of your mailpiece to your mailpiece design analyst or show it to B&C and make sure the mailpiece qualifies for the class of mail and postage price you want. Some up-front investigation could save you thousands of dollars in unplanned postage costs. 5 electronic Delivery Confirmation, bulk insurance, and return receipt for merchandise. Standard Mail is not forwarded or returned unless you request it with an ancillary service endorsement. Forwarding and return services will result in additional fees or postage. Lower nonprofit prices are available for Standard Mail but require specific authorization. Standard Mail is for domestic mail only. You cannot send Standard Mail to international addresses. 3. Nonprofit a.there are special Prices for Nonprofit Standard mailers o Organizations wishing to mail at nonprofit Standard Mail prices first must be authorized by the Postal Service as eligible. 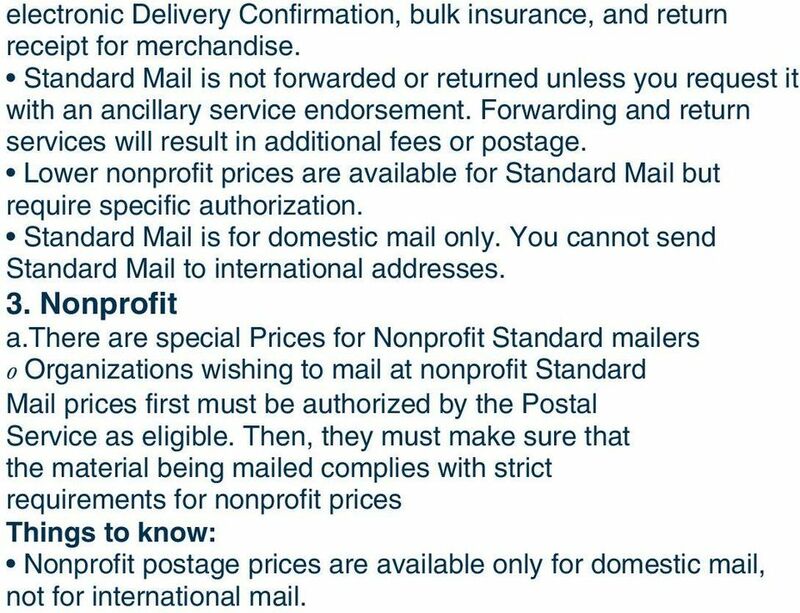 Then, they must make sure that the material being mailed complies with strict requirements for nonprofit prices Things to know: Nonprofit postage prices are available only for domestic mail, not for international mail. 10 File, Second Generation (DSF2). c.delivery sequence information from USPS address sequencing services, as requested by the customer. Out-of-DateWalk Sequence Information - [8-3-09] Mailings prepared with out-of-date walk-sequencing or delivery statistics information are not eligible for prices requiring walk-sequence preparation. Questions? Just ask your B&C contact. DIRECT MAIL SOLUTIONS. Redi-Mail Direct Marketing 5 Audrey Place Fairfield, NJ 07004 973.808.4500 sales@redimail.com www.redimail.